Baiturrahman Great Mosque to be a religious tourism object that can make every tourist who sees the history and beauty of its architecture, Baiturrahman Masjid Agung is one of the most beautiful mosques in Aceh which has classic architecture and very interesting carvings, and a spacious courtyard with swimming pool. The pool is depannyan and will feel very cold when in the mosque. The Grand Mosque of Baiturrahman is renovated with great luxury and luxury, there is a parking lot and a very luxurious ablution place in the basement. Outside the mosque was also renovated by installing umbrellas and almost the entire yard using marble, thus providing comfort during worship. Thus making many people come and become a religious tourist attraction. 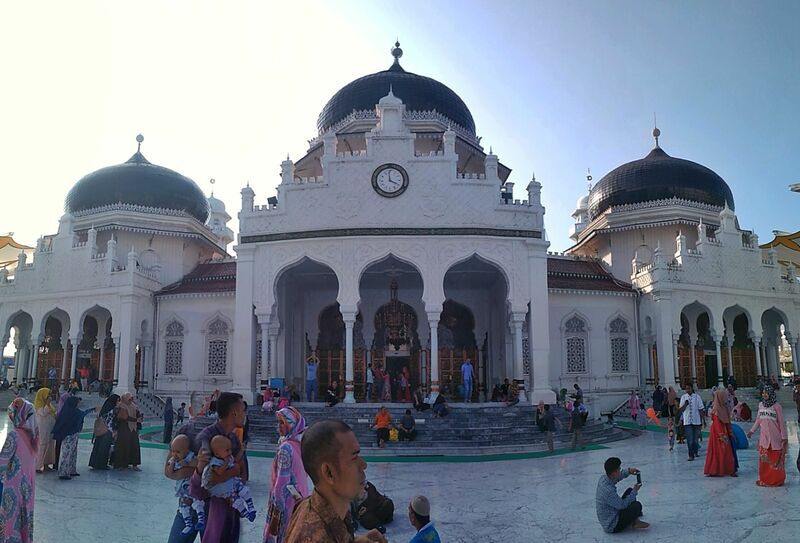 Many tourists from within and abroad take a vacation to Aceh to visit this Baiturrahman Grand Mosque. Masjid Raya Baiturrahman is an Aceh mosque built during the reign of Sultan Iskandar Muda since 1022 H / 1612 AD This magnificent and magnificent building is located right in the middle of Banda Aceh City and becomes the center point from all directions in Aceh. Where it is located? In istanbul? his posts outside can be friends. This post has received a 2.13 % upvote from @booster thanks to: @anwarabdullah. One of the most beautiful mosque in Asia..
Congratulations! This post has been upvoted from the communal account, @minnowsupport, by anwarabdullah from the Minnow Support Project. It's a witness project run by aggroed, ausbitbank, teamsteem, theprophet0, someguy123, neoxian, followbtcnews, and netuoso. The goal is to help Steemit grow by supporting Minnows. Please find us at the Peace, Abundance, and Liberty Network (PALnet) Discord Channel. It's a completely public and open space to all members of the Steemit community who voluntarily choose to be there.